Did you know that even Chef Mindy goes to other delis? That’s right! We don’t serve every bit of deli fare that she craves. I mean come on have you seen how small our place is? A good Gyro is one of those things she finds herself dreaming about. You can’t beat a super flavorful meat and a creamy sauce I mean COME ON! Are you drooling yet? This week we decided to do something about it. We searched high and low for a unique way to bring you the satisfaction of a gyro without having to buy a special spinny roasty meat cooking thing. So sink your teeth into this week’s special “The Gyro Hero”. 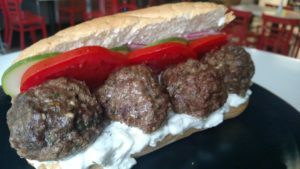 House made gyro style meatballs & tzatziki sauce (amazing yogurt & cucumber sauce. If you’ve never had it you’ll have to trust us that it’s AMAZING!) served on a hoagie roll with fresh tomato, cucumber and red onion.